Interested candidates can check all the details of NCHMCT NHTET-2019 (MAY), like application form, eligibility criteria, application procedure etc. from this page give below. 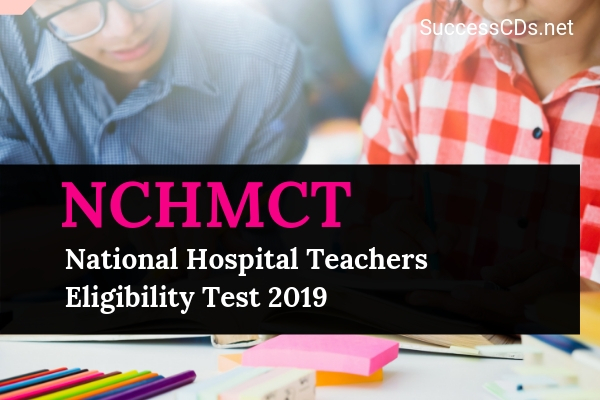 The scheme is to filter the best among the better to declare them eligible for Assistant Lecturer and Teaching Associates in NCHMCT affiliated IHMs and will be known as NHTET Scheme. The scheme will be applicable to the citizen of India who fulfils the other eligibility criteria prescribed under this scheme. The candidate declared eligible for Assistant Lecturer or Teaching Associates will have the only right to apply against any vacancy, if announced by NCHMCT affiliated any IHM, irrespective of either Central Govt. Institute, State Govt. Institute, PSU Institute or Private Institute. The NHTET qualified candidate will not have any right of automatic induction in NCHMCT affiliated any IHM. They have to face a separate selection process for induction as Assistant lecturer or Teaching Associates to be conducted by the individual institute. Any NCHMCT affiliated IHM shall not recruit any teaching faculty under direct recruitment against any regular vacancy if the candidate does not have a valid NHTET pass certificate. Note: NHTET is compulsory to become eligible to apply for the direct recruitment posts of Assistant Lecturer and Teaching Associates in all the 59 IHMs functioning under the umbrella of the council, either the institute is sponsored by Central Govt., State Govt., PSU or by Private, since it made the part of Affiliation regulation. Full time Master’s Degree in Hospitality Administration/Hotel Management after Bachelor’s Degree in Hospitality Administration / Hotel Management from a recognized University with at least 60% marks either in Bachelor or Master’s Degree. Candidates appearing in the final semester/final year exam of the master’s degree and have passed all subjects of previous year/ semester, and also having Bachelor’s Degree in Hospitality Administration/Hotel Management from a recognized University with at least 60% marks, can also apply. On passing the NHTET they will be allowed to apply against any vacancy of AL and TA (of which maximum) age is 30 years with relaxation for reserve candidates). Step III: Those candidates who have not cleared step I, a detailed mark sheet will be prepared with a remark ‘not cleared’ and will be displayed in the web portal www.thims.gov.in. Candidates must apply online only at the Tourism & Hospitality Institute Management System website www.thims.gov.in after checking out the detailed brochure which contains information about the exam scheme and passing criteria. Admit card can be downloaded from the portal website. No printed Admit card will be sent by surface mail to any candidate. No candidate will be allowed to enter in to the exam hall without a print out of Admit Card and the original ID Card uploaded in the application form.